To a potential collaborator: First, feel free to contact me, or forward my address, with regards to problems or projects for which mathematical solution approaches can be developed. I am interested in problems from industry and academia alike. Second, I am planning to graduate in spring 2018, and will be looking for Post-Doc positions in Mathematical Optimization or Numerical Linear Algebra. If you know of any such positions, please let me know! I hold a PhD in Applied Mathematics from the University of California Merced, mentored by Prof. Roummel Marcia. I engage in the development of solution approaches for different mathematical problems, particularly in the realms of numerical linear algebra and mathematical optimization. My goal is to develop novel and innovative methods for problems from academia and industry, respectively. Prior to coming to UCM I worked as a Quantitative Analyst for an investment bank, and as a quantitative software developer for a technology startup. My Master of Science degree from Maastricht University is on Stochastic Processes applied to the modeling of interest rates in mathematical finance. April 26th: Successful PhD dissertation defense. March 9th: Presentation "On Quasi-Newton Matrices For Multivariate Optimization" at UC Merced's SIAM student chapter seminar. Nomination towards Graduate Dean's Dissertation Fellowship during spring 2018. Conference, Optimization Methods and Software (OMS), in Havana, 16-21, Dec., 2017. Prof. Ya-xiang Yuan, Institute of Computational Mathematics and Scientific/Engineering Computing, Chinese Academy of Sciences, China. 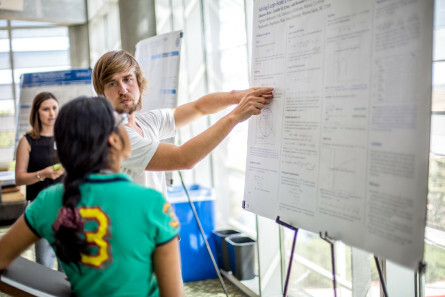 2015 Summer: SDSC UC Graduate Summer Fellowship, San Diego Supercomputer Center, with Dr. Andreas Götz. Projects that we currently pursue are: (A) Large-scale Trust-Region Methods, (B) Compact representation of quasi-Newton matrices, (C) Eigendecomposition of quasi-Newton matrices, (D) Low rank updates to matrix factorizations.